On a Chalk Hillside - Developing our garden. 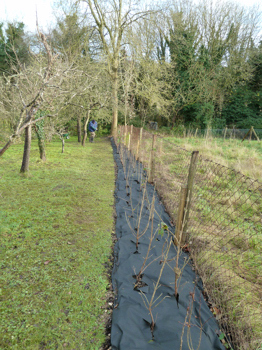 This week as I am dodging orb spiders, pruning the new mixed native hedge I thought I would tell you about putting in our new hedge which runs along the right hand boundary of the orchard almost 40 meters from the wall part way down the garden nearly to the bottom of the garden. We hankered after a hedge in this garden from the start, but where to put one? High features across the garden would cast a lot of shade down the slope, and might interrupt the view – we want to keep that borrowed landscape view in as many places as possible. The obvious place was down the right hand side of the orchard, where there was a low chain-link fence. The state of that chain link fence, which we could no longer keep propped up on our neighbours’ behalf against their dog getting into our garden, and the fact that the closest plum tree to the fence had bitten the dust eventually, finally caused us to decide to invest in a hedge. The fence would provide a bit of a shield for it in its early years, and it would hopefully be stock proof by the time the fence completely gave way. Once we had decided where, that affected what sort of hedge we wanted. When you go to Powys Castle, or Kingston Lacy, or Great Dixter you see the yew hedging in all its wavy glory, and you want it too. Then you drive past several glorious beech hedges in the neighbouring villages with their dried leaves still in situ in the depths of winter and hanker after that. We were very taken with Hornbeam as an alternative to beech, after all Monty Don had some. But then we fixed on the orchard boundary as the location for the hedge, and it didn’t suit a formal evergreen hedge, and even beech or hornbeam seemed a bit too grand for the setting. Many of the farm fields bordering roads round here have a mixed hedge, several different leaf shapes and colours and we decided this was the route we wanted to go down. A local tree and hedge supplier provided a native mix for our locale as bare-root whips about 60-90 cm tall. Our native mix contains hawthorn (Crataegus monogyna), blackthorn (Prunus spinosa), field maple (Acer campestre), wayfaring tree (Viburnum lantana), and guelder rose (Viburnum opulus). This is designed to provide blossom in spring, berries and leaf colour in autumn. (Interestingly if we lived a few miles south in the New Forest, our native mix would have substituted holly (Ilex aquifolium) for the Wayfaring Tree. 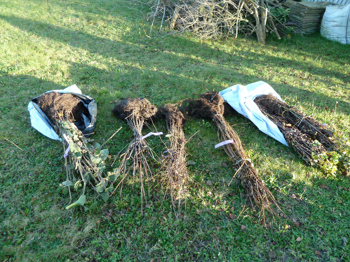 We would be collecting our hedging whips when they were dormant, any time from mid-November to March depending on the weather, we chose early December, to give us time to get the ground ready. To begin with we needed to remove all weeds and grass both sides of the fence. We cleared a 15cm trench on our neighbour’s side, digging out small self-seeded sycamore saplings, brambles, ivy, and grass. Over the years the birds had seeded many privet, ivy and old man’s beard plants at each post on the fence, and we had quite a challenge to dig the roots out whilst not disturbing the posts too much. Some posts had to be shored up as we went down the 40 meter length. On our side of the fence we cleared a 75cm trench, de-turfing, weeding and digging over as we went. This is when saying 40 meters sounds so much shorter than 130 feet – it took a long time! 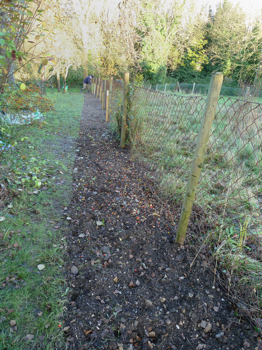 The ground was very compacted, and the chalky topsoil extremely shallow, we dug it over to the depth of a spade, and dug in our own leaf mould, and when we ran out of that tree and shrub compost, together with blood fish and bone. Advice seems to change from year to year about whether you should enrich the soil for trees below the roots, above the roots, not at all. We decided that as the soil was very poor indeed, we needed to do some improvement, but stopped short of adding manure. To keep water in and stop weeds competing with the newly planted hedge we pegged down horticultural weed-suppressing membrane along the length of the trench – at last, ready for plants! Friends and family were worried that we would not be able to fit the 210 trees into our car when we went to collect them. 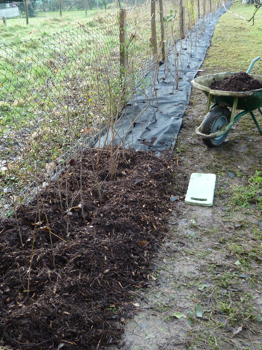 It was slightly deflating to find our order consisted of two medium bags of twigs that I could carry in each hand! On unpacking and soaking the whips, the viburnums had the largest most fibrous rootballs, and the other species hardly any to speak of. 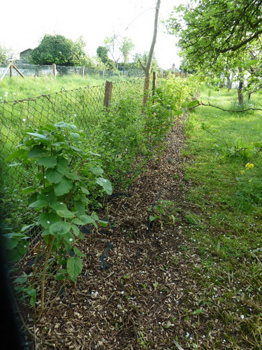 We decided on a “double baffle” planting – two rows slightly staggered, in practice like a continuous VVVVV so that they were about 38cm apart in each direction. We had never planted through membrane before, and had some difficulty with cutting the cross the correct size for some of the extremely “wonky” root balls, and scooping the soil away under the membrane but keeping the overall surface level and not burying the tree too deeply. However, over such a long length we had lots of practice and definitely got quicker. I put some blood fish and bone in each planting hole as the whip went in. (It is currently very fashionable to use mycorrhizal fungi to put on the roots as you plant the hedging material, it is claimed it improves growth of roots so that the first year top growth develops well as well as the roots establishing – so you get your hedge looking chunky a year quicker. However, it is very expensive; it would have cost us three times more for the fungi than the hedging plants, and we decided against it. We planted in groups of four or five of the same species, either two at the back three at the front or vice versa, so that there was a definite clump of each rather than a very spotty effect. Finally, we covered the membrane with bark and wood chippings. We had very few casualties the first year – a couple of hawthorn needed replacing, but we had a few spares heeled in elsewhere for that, and the trees generally didn’t make much top growth (we assumed they were putting down roots), whilst the viburnums behaved more like shrubs and did make more top growth. Having let them grow on with just a bit of tip pruning last autumn, this autumn is the hedge’s first serious prune. 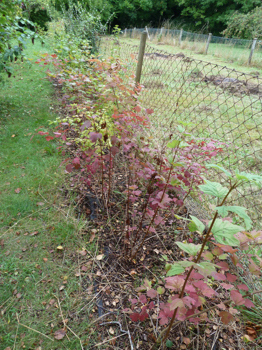 As you can see from the picture, this year there has been more top growth on most species, and I am very taken with the autumn colour of the guelder rose – white flowers in early summer, red berries and now red leaves, I shall be taking some cuttings as I prune so I can plant some elsewhere in the garden. My main aim with this prune is to encourage the plants to become bushy from the base. According to my RHS Guide to pruning hedges I need to reduce the hawthorn (and probably the blackthorn) to about 15cm from the ground, and to take the leading shoot out of the rest of the species, and reduce side shoots by a third. I will let you know how the hedge responds to this treatment. Next time I will turn my attention to other autumn jobs in my garden including seed collecting and ways I have built up plant stocks for our larger garden. 0 Comments To "On a Chalk Hillside November 2016 (2)"